RenoSys: "Focused on Aquatic Renovation and Construction"
Proudly Made in the USA! Since 1988, RenoSys has been manufacturing and installing commercial pool product systems designed for the cost effective renovation and construction of public pool facilities. We are best known as the pioneering leaders in the heavy, 60 mil, textured reinforced commercial pool membrane industry, a European technology that was new to North America at the time. 28 years later, "The RenoSys PVC Pool Shell" is indeed the "Superior Pool Interior" and is the preferred method for ensuring watertight pool renovations and new construction projects. RenoSys is frequently mechanically connected to a new stainless steel gutter system to make the entire old deteriorated pool "like new." RenoSys has also developed several complementary products over the past three decades including the following signature brands. RecDeck is a highly textured, watertight PVC slip resistant flooring for pools and locker rooms. DuraTech Pool Gutters that are available in both PVC and stainless steel. 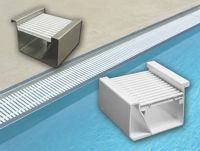 DuraTech Grating offers numerous types of PVC, polymer, fiberglass, stainless steel as well as granite pool grating. DuraDrains are designed to match the DuraTech Grating system for a comprehensive grating solution. SoftSide Safety Padding is used both for activity pool slides as well as under diving boards for fall protection. FuturaPool provides new pool builders a remarkable patented stainless steel/PVC high tech method for building commercial pools. In an era where much of the commercial aquatics industry has been gobbled up by venture capital conglomerates, RenoSys is proud to still be family owned and operated. DuraTech™ Stainless steel and PVC gutters provide reliable, proven and affordable perimeter recirculation systems to meet any aquatic design challenge. Stainless steel option combines gutter and plumbing into a built-in-trough with pressurized water return and inlets that reduce maintenance by eliminating buried pipes that break from freeze-thaw damage or ground movement. PVC gutter option provides a cost effective alternative to stainless steel and is the ideal solution for indoor pool renovations. 15-year warranty. Made in USA.